Whether crafted from bridle, saddle or any other kind of leather, discover how to expertly care for your luxury accessories in this article. Whitehouse Cox’s leather accessories are incredibly robust. You can expect the items to last an average of 9-12 years with daily use, even if you don’t follow the advice in this article. So why bother providing advice on how to care for luxury leather accessories if it’s unnecessary? Whitehouse Cox items take on a unique patina as they age and most of you will have a personal preference on how you like your accessories to look. We know, for instance, that many of you love the ‘lived in look’. After all, each mark tells a story and after a decade your Whitehouse Cox item will have plenty of tales to tell. Then, there are those of you who will love to keep the item looking as close as possible to the unblemished aesthetic you unboxed. For the latter, you will enjoy this article and should heed the advice within it. For those who like their leather with a blemish or two, you can take or leave it. Here at Whitehouse Cox, we have champions of both practices, so you won’t hear us telling you either is right or wrong. Without further ado, here is the strategy for keeping your accessory looking prim and proper. It’s really rather simple! To maintain Bridle Leather simply apply Whitehouse Cox Hide Food sparingly with a soft lint-free cloth in a circular motion until all the leather is covered. 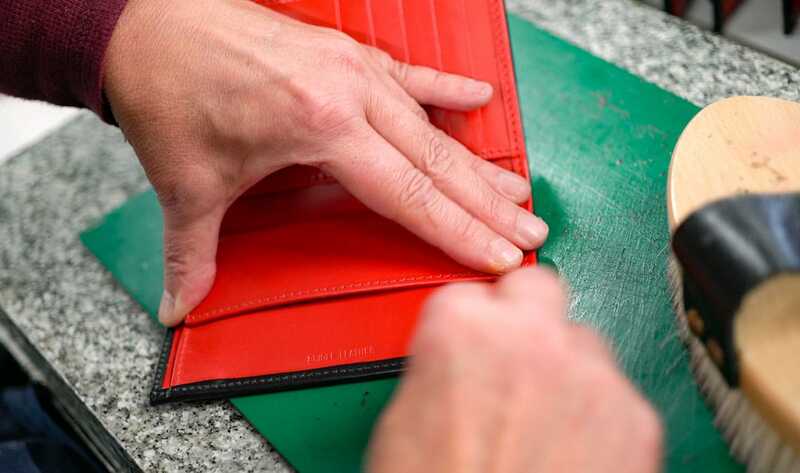 Leave the item at room temperature overnight to allow the oils to penetrate into the leather. Next morning brush off any excess unabsorbed grease with a clean soft bristle brush or buff up with a lint-free duster or cloth. This will replace the oils that keep the leather moisturised and supple, which stops it drying out in our centrally heated homes and workplaces. This may darken some light coloured Bridle leather and temporarily dull the surface, but the burnished polished character will return again after just a few weeks use. If you use your Bridle leather item every day, repeat this process every six months to keep the leather moisturised. 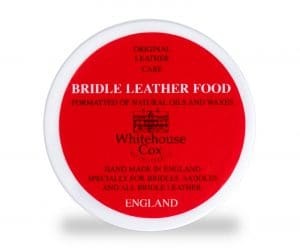 Click the image below to purchase Whitehouse Cox’s Hide Food for bridle leather. Whitehouse Cox has an extensive saddle leather range. Saddle leather burnishes with use, giving each item a beautifully unique patina. 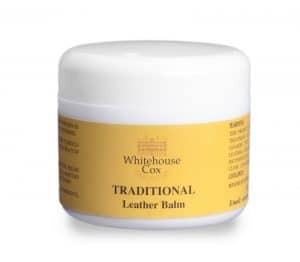 Saddle leather can be maintained by applying our Whitehouse Cox Leather Balm sparingly with a soft clean lint free cloth and applied using light pressure only in a circular motion. Once the item has been covered, ideally leave overnight at room temperature and in the morning use another clean cloth to wipe off any excess Balm. If you use your Saddle leather item every day, repeat this process every three to four months to keep the leather moisturised. If you wish to discover more about the differences between bridle and saddle leather you can do so in this article. Purchase Whitehouse Cox’s leather balm by clicking the picture below.